The Yellow Dyed Dendrobium Orchid is a Bombay orchid dyed yellow. It has several sweetly-scented, long-lasting blooms. The orchid symbolizes ecstasy, and is a popular flower for wedding bouquet, table centerpiece or flower arrangements. Free Shipping! 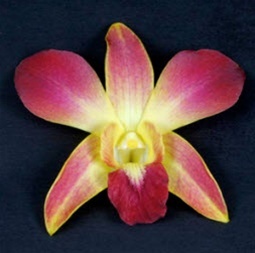 To retain the dendrobiums radiance for up to two weeks, follow these healthful hints. Trim up to 1/2 inch off the stems. Place the flowers in clean cool water for 5-10 minutes. If you have received dendrobiums and they are wilted upon unpacking, simply submerge whole sprays for 10 to 15 minutes in cool tap water. Trim stems and change water 2 times a week. Keep flowers away from heat and temperatures below 45 degrees F.
Dendrobium orchids are slightly sensitive to ethylene. To avoid ethylene buildup, you'll want to ensure adequate ventilation and sanitary conditions. What are the ideal storage conditions for dendrobium orchids? These tropical treasures will stay their loveliest when held in water and at 50 to 55 degrees F. Holding dendrobiums for more than a week at temperatures below 45 degrees can cause blooms to discolor or drop. Recut stems once or twice per week. Use clean water with or without a floral preservative. Keep flowers away from heat sources. Dendrobium orchids are the most popular, economical orchid for weddings and events. You'll often find them gracing wedding bouquets and arrangements. We get our wholesale dendrobium orchids year-round from our farms in Thailand and Hawaii. Our dendrobiums are long stems 22 to 24 inches tall. Our dendrobiums are long stems 22 to 24 inches tall. The most mature, larger blooms (5-7+) are at the base, with the newer, small looms toward the tip. If you re-cut the stems and change the water every 3 days, you can greatly extend vase life. We can ship them in solid boxes or white, purple, bi-color purple/white (Bombay), blush, green or peach. Or you can order an assorted box.